Horror movies get all of the attention around October, but books can produce their fair share of Halloween-appropriate scares as well. 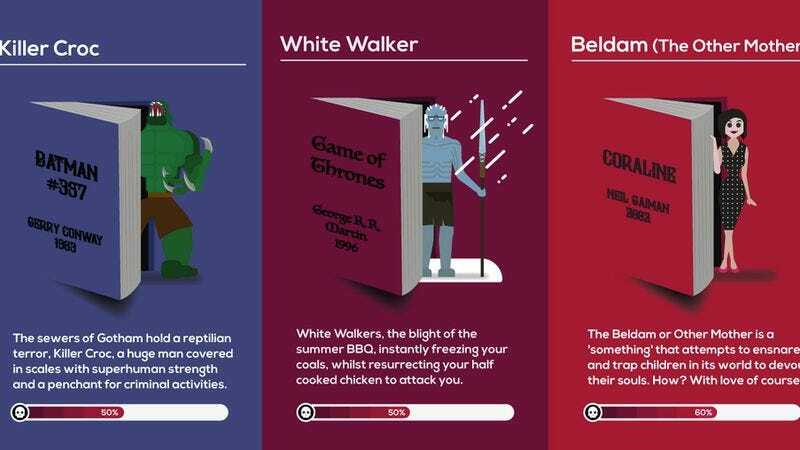 So costume company MorphCostumes decided to rank the scariest monsters in literature in a brand new infographic. To come up with the final “scream score,” the company looked at a combination of appearance, power, and evil intent. The monsters are pulled from both contemporary and classic literature, which allows for some interesting juxtapositions. The graphic asserts that H.G. Wells’ Morlocks are just as terrifying as George R.R. Martin’s White Walkers (which is arguable) and that the Nazgûls from Lord Of The Rings are 5 percent scarier than the Dementors from Harry Potter (which seems about right). Meanwhile It’s Pennywise is the only monster to snag a 100 percent scream score. We’re sure he’s thrilled.